Cast bronze. Flange is machined to fit hull and grooved to retain bedding compound. Neck is threaded.. 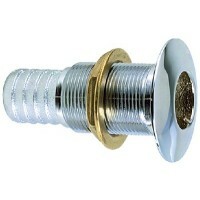 Available in plain or chrome plated bronze, these fittings have a hose barb connection and are recom..
Molded white plastic with broad flange. For use with hose. Not recommended for use below waterline. 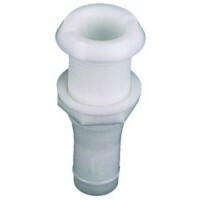 ..
Molded white plastic with narrow flange. For use with hose. Flange: 1-1/2" ODMax HullThickness: 1-7/.. Cast bronze. 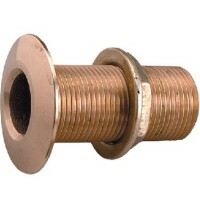 Similar to 322 series except neck is threaded to between 1 and 1-1/2" from flange. 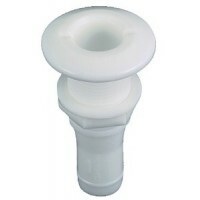 Max ..
Molded white plastic with narrow flange. For use with hose. Flange: 2-1/2" ODMax HullThickness: 1-7/..
Accommodates all Shurflo demand pumps with 1/2" MPT. Hand tighten. 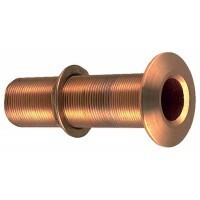 Size: 1/2" - 14" NPT (F) x 1/2" B.. Accommodate all Shurflo demand pumps with 1/2" MPT. “Wing" style hand tighten and hex head style. T..
Accommodates all Shurflo demand pumps with 1/2" MPT. Hand tighten. Size: 1/2" - 14" NPT (F) x 5/8" B..
Accommodates all Shurflo demand pumps with 1/2" MPT. Hand tighten. 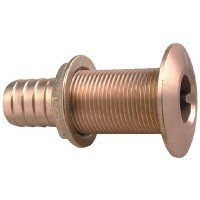 Size: 1/2" - 14" NPT (F) x 3/4" B..